the passing of Captain Leland C. Molbreak. Notification with the passing of retired North Central pilot Captain Leland C. Molbreak, nearing his 100th birthday. Captain Molbreak retired prior to the merger with NWA. 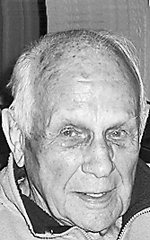 Leland Clarence Molbreak, age 99, died peacefully in Bradenton, Fla., on May 1, 2017. He had been living in a retirement community after leaving Eagle River last year. Lee was born in rural Wisconsin on May 14, 1917, and was raised in Monona, Wis. With the onset of World War II, he enlisted in the Army Air Corps. He was a B-26 bomber pilot and was awarded the Purple Heart. After the war he continued flying as a commercial pilot for North Central Airlines, and retired after a successful career in 1978. He left Monona in 1965, and built a house on Cranberry Lake. While he spent the winter months in Florida, he always considered Eagle River to be his home. He referred to it as “his crown jewel” because he felt the area was so beautiful. Lee was buried on May 15 at Sarasota National Cemetery with full military honors. Lee was preceded in death by his parents, Clarence and Wilhelmina Molbreak; his sister, Orvella; and his sister-in-law, Jean Molbreak. He is survived by his brother, Vernon, of Madison, Wis., and Bradenton; and five nieces and nephews.